Family Meals are better for your mental health, your physical health and your wallet. Below is just a small sample of evidence. 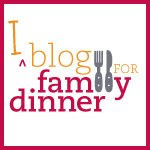 Creating the family dinner promotes healthy eating. Many studies identify nutritional benefits associated with eating meals together. One study, conducted by the Baylor College of Medicine, demonstrated that meals eaten together consist of about 50% more fruits and vegetables than meals consumed alone. In addition, family meals are three times more likely to include low-fat choices and are far less likely to include soda. In another study, Harvard University researchers found that children who ate dinner with their families were more likely to have better nutritional intakes at meals. The study identified families where mothers worked to underscore the fact that family dinner was possible even when parents had less time. Family Dinners get better with practice. It will for your family too!